Last Saturday I found some neat old kitchen utensils while thrifting. When I first picked up the jar grabber at the consignment shop, I was thinking it would work for displaying old photos with a magnet or clothespin. I made a hole near the top on each side of the dripolator. Then simply tied the jar grabber part to the hole with twine. This way I can remove the jar grabber for other uses too. I tied a piece of twine to the hole on top and hung my planter on a hook in my kitchen. Faux greenery and a tag have been added to finish off the dripolator/jar grabber planter. If you wanted to grow real herbs or houseplants in my planter you would have to put a plastic pot inside the dripolator as it has holes in the bottom and would leak. 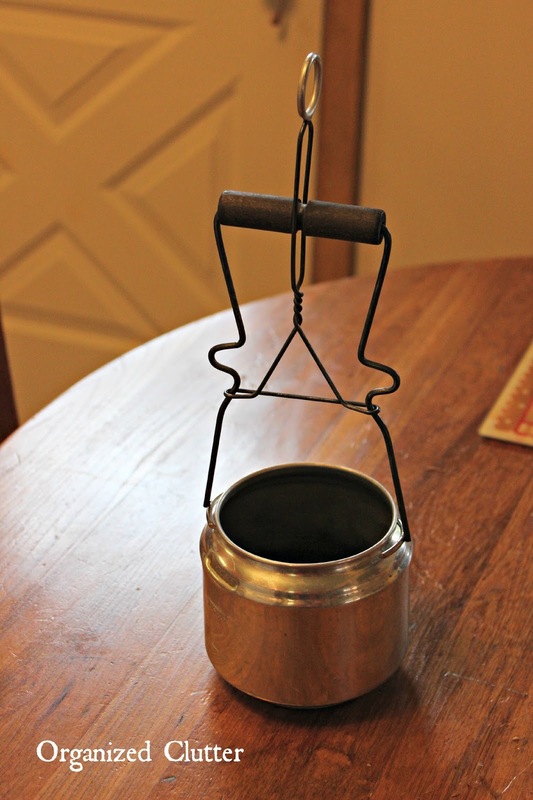 A very easy, and fun, re-purposing idea using thrifted kitchen utensils. What a cute repurpose idea! Cute, cute, cute! You come up with such ingenious ideas! Oh yeah! I love this Carlene!! This is very cute, Carlene! I need to get one out of my stash and see what I can do! Thanks for sharing! Just perfect all the way down to the cute tag! Love it......I need to find one of those grabbers!! Charlene, you have such amazing ideas!